Jake and I had to take a little trip up towards Ontario, CA and so I scouted out some places for us to try for lunch. After waffling over my decision, I ended up picking “The Hat” as our restaurant of choice. It was reasonably priced, near where we would be, and I kind of digged the name. “The Hat”? Sure, okay. I’ll bite. 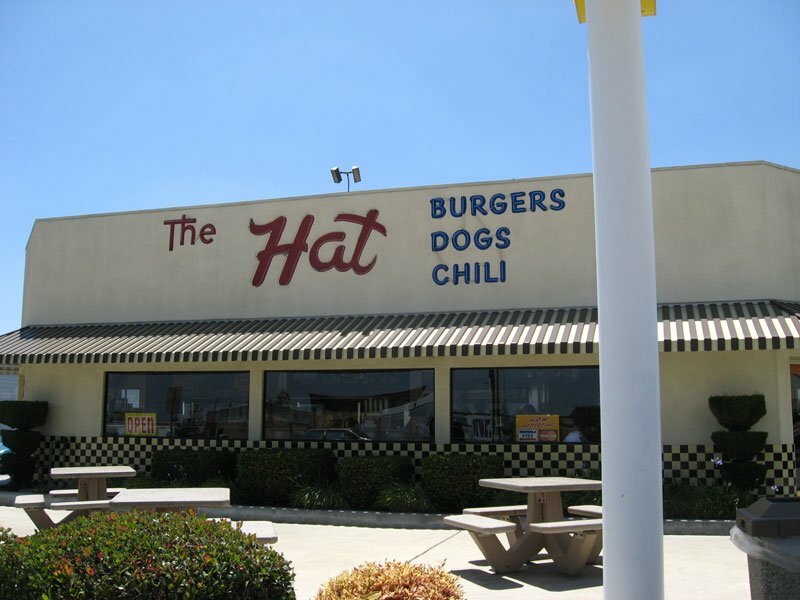 The Hat is a long running chain of restaurants in San Bernardino and Los Angeles area, famous for their pastrami dipped sandwiches (which account for about 40% of their business!). 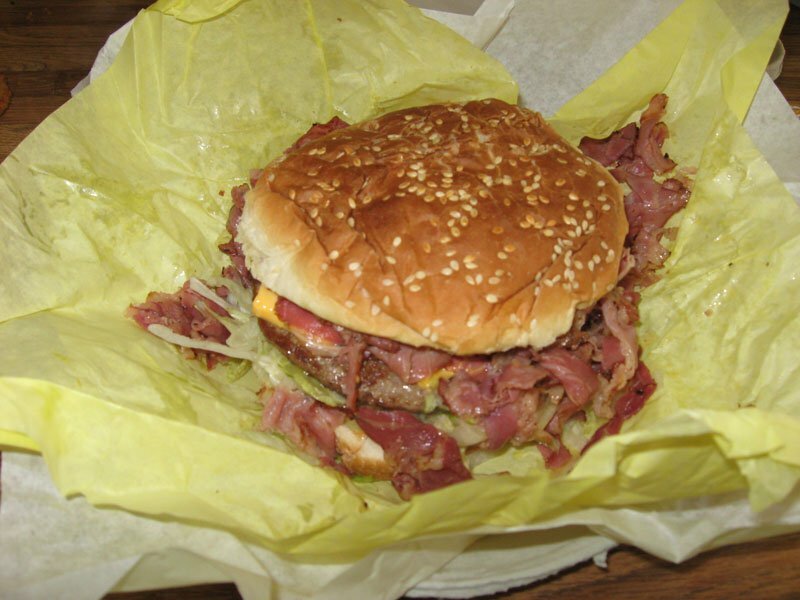 I decided to try the pastrami burger ($6.99) and Jake got the double chili cheeseburger ($4.69). 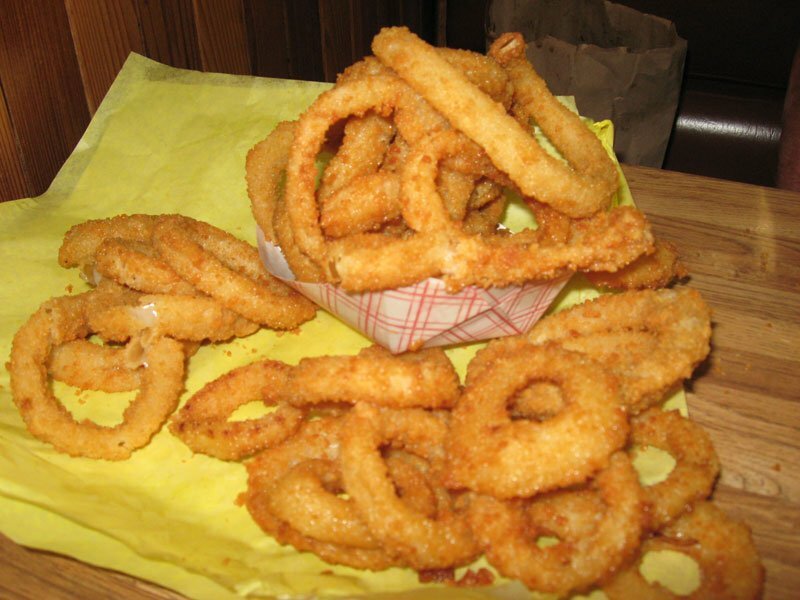 We also shared some onion rings ($3.79) and gravy fries ($4.09) to complete our meal. Little did we know that the portion sizes were HUGE. This doesn’t look that big yet. But wait a minute. Let me show you after I took a few bites and took some of the pastrami off (just so I could fit it into my mouth). 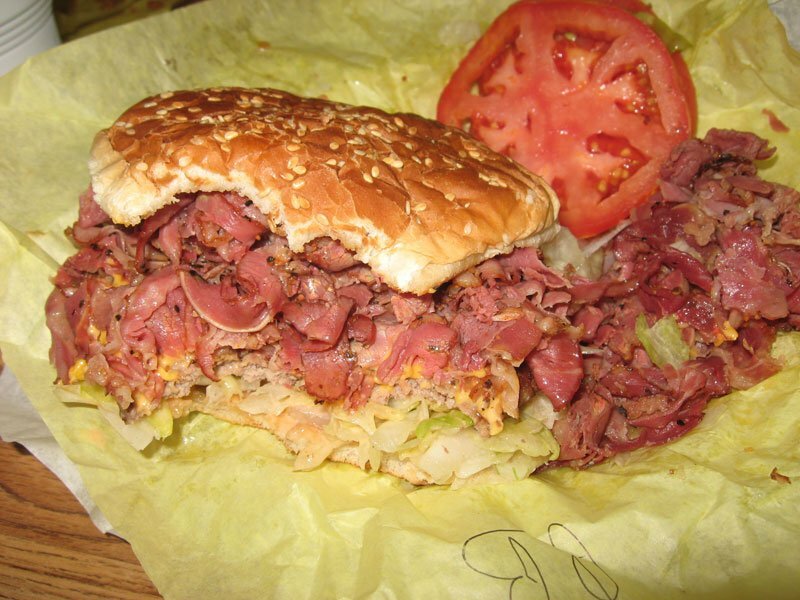 You can’t even see the burger under all of that pastrami! I could have made another sandwich with the amount of meat I took off! Holy crap! The pastrami was pretty darn tasty. I’m not usually a huge pastrami fan, but this was a good quality pastrami. Not too salty, flavorful and a bit juicy and well seasoned. I liked it. 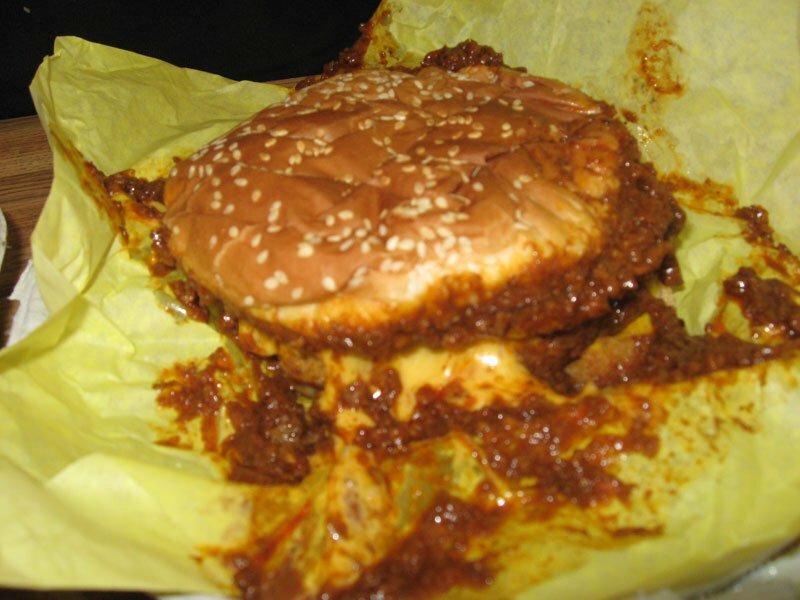 I believe this is the messiest burger in existence, the Double Chili Cheeseburger. Jake really liked this, he really enjoyed their chili. I’m sorry, but we ordered the large onion rings? Hell-oooooo. I don’t know if you can tell, but this is also like a Mound o’ Fries. Pretty good. Gravy on my food isn’t my favorite thing ever, but Jake totally freakin’ loved these. 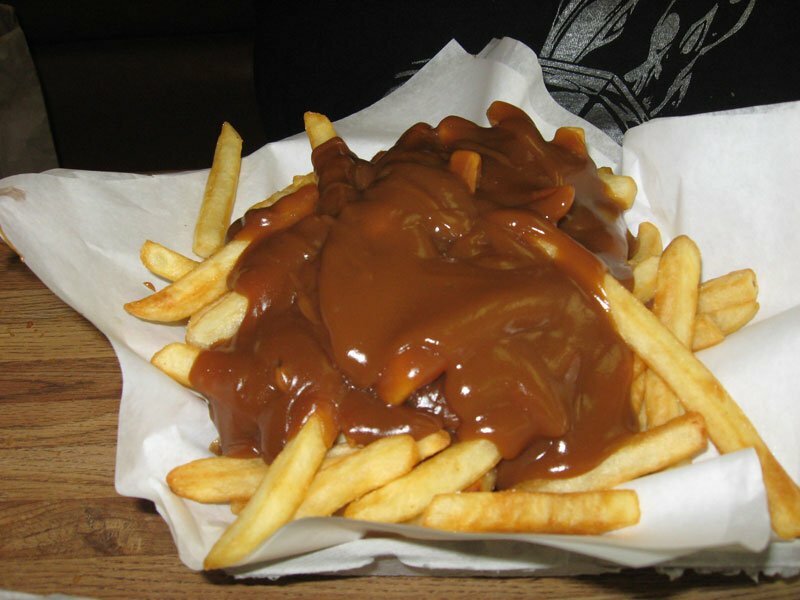 I ate them, too, but not with as much vigor as he did as I am not a super duper lover of the gravy boats. All in all, we really enjoyed our experience at The Hat. Good quality food for a good price, we wished there was something like this down in San Diego! And I know Jake is going to miss these fries a lot. i love their pastrami fries! their regular cheeseburger is pretty good too. you’re right though, it’s way too much food….